I was meaning for the centre box, but it sounds like you'll just have plugs? If you’re running it as a single fin, then you’ll need more fin than if it were a 2+1 setup. Consider the total surface area of either setup to give you enough hold and drive. As a single, a fin around 8” give or take a half inch would suit. If you use too big a centre fin in a 2+1 set up the board will be hard to turn. I’ve got a spare 7.5” fin I can mail up to you. 2+1's are interesting. It's great reading this stuff. I have a few of them in the 6ft plus range and haven't really experimented with fin types so the words above are very helpful. I've been influenced by some to use 6 1/2 - 7 inch single fins for boards below 7ft. And the smaller the single the larger the sides. Basically the smaller single with larger sides ride is closer to a tri fin and the larger fin with smaller more like a single. Prob makes sense. But I'm keen to try the bigger fin. I have an 8 inch flex tip I'll try in my heavier board with smaller sides. if it's long walls i'd rather just run a single and draw lines out full stretch. the l-flex is a good fin. the 2+1 will allow you to break and change your line easier if there's constant change and sections. in any case, to get the best out either set up, you want good waves with some wall and push and open face to take to. 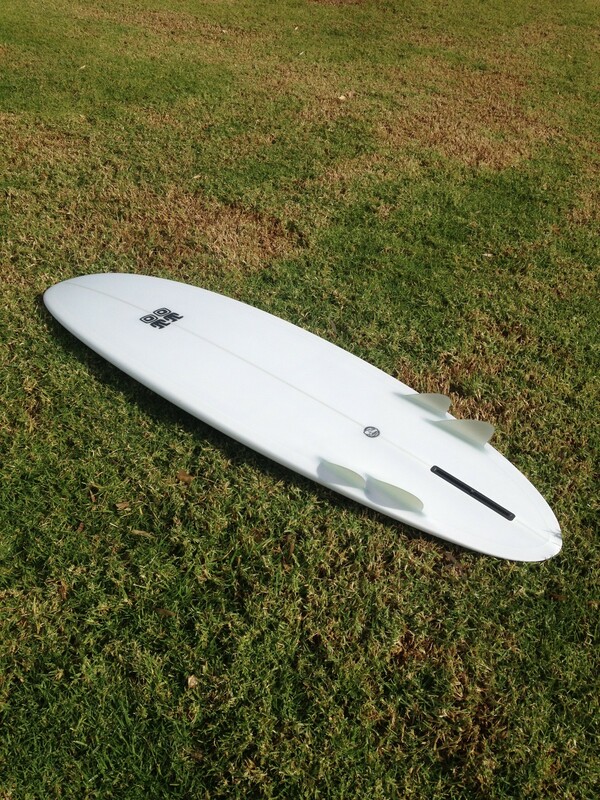 This board is only 6’0 and runs an 8” inch flex fin set halfway forward. Easy to turn, loads of drive off the bottom, holds in well in solid overhead surf. Small boards can still run a larger fin. Oh yeah for sure. Board looks fun. I was specifically talking the 2+1 combo. Keen on trying an 8 in a shorter board. Anyone order a bonzer from Malcolm when he was out a couple of months ago? What did u get? Have u got ya grubby lil hands on it yet? I spoke to a guy who ordered a 7ft bonzer for smaller says. I went to explain that that's not their use but stopped myself and said "enjoy it". I walked off thinking "how could he get it so wrong"
Maybe he meant small pipeline lol! Got it - 5'9, 19 1/2, 2 1/4 - egg. It's really refined, with HP rails and a pulled in nose and tail. Have surfed it about five times. Great allrounder. Really gelled with it from the first surf, which i don't often do with bonzers. Shoulder recovery is slow, so i can only surf once to twice a week, but am glad i have this board for winter. Looks unreal. The rails feel great on those things. Saw a few nice ones in a surf shop in Ventura and some awesome mals as well.